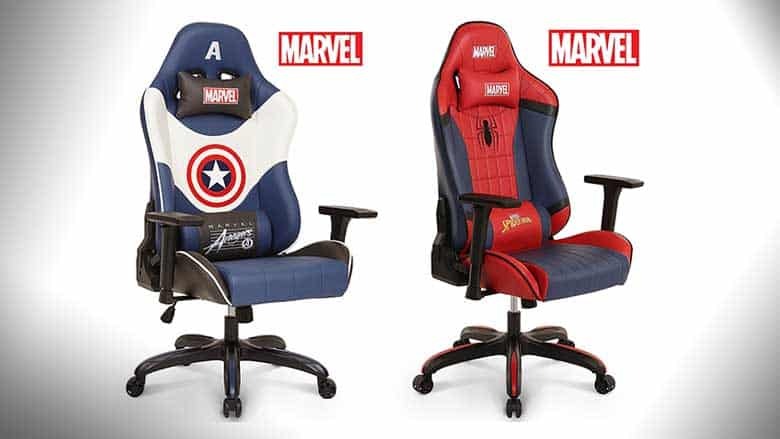 Premium Marvel Gaming Chair: Spider-Man, Captain America, & More! | Nerd Much? It’s a problem that we have almost all faced at some point — I’m talking about inadequate support. Everything seems to be going just fine and then a creeping pain settles in, slowly affecting your concentration and ability to work, game or study. Of course, I am referring to your desk chair. It is finally time to level-up your gaming chair to something that truly supports you, and we have found the ultimate gaming chair for superhero enthusiasts: the Marvel Licensed Super Premium Gaming Chair. Well-known gaming chair brand Neo Chair has now released the officially Marvel Licensed Super Premium Gaming Chairs that use the likenesses of some of our favorite Marvel heroes, including Spider-Man, Captain America, and Iron Man, and these chairs have everything you need. They’re specifically designed for those “who spend long periods seated” and include an ergonomic backbone structure and lumbar support. Ease the strain on your back and spine while reclining as much as you like, with up to 180 Degree back-tilting capabilities. Synchro-tilt control and optimal pneumatic lift help make this the perfect chair for your home or office. Included with the chair are a neck-line curved head cushion and height adjustable back cushion that compliment your comfort, as well as the chair’s sleek design. Produced under an official Marvel license for fans of the Marvel franchise, this chair is available in Spiderman red and blue, Ironman red and gold, and Captain America red white and blue. All designs include the Marvel logo prominently, as well as several accent designs specific to the character chosen. This means that they all look ridiculously good, and you’ll be proud to have one at your desk. Made with high quality materials including premium leather, and a specialized steel base it is built to support up to 320 lbs. It even received BIFMA certification, “the benchmark for sustainable commercial furniture”. In case this wasn’t enough for you, you can also order the matching Super Premium Ottoman Stool. Also available on Amazon, they’re designed to match the chairs perfectly. Currently ranking 4.5 out of 5 stars and pricing at $278.00 on Amazon, this chair is even available with free shipping. Feel like you need a little reminder of your Marvel fandom before committing? Check out our review of Avengers: Infinity War and get ready to add this chair to your wish list.